London based Venezuelan producers Juan Laya & Jorge Montiel teams up with from man – UK singer – Andre Espeut for another winner with their latest project Andre Espeut’s Quintet. 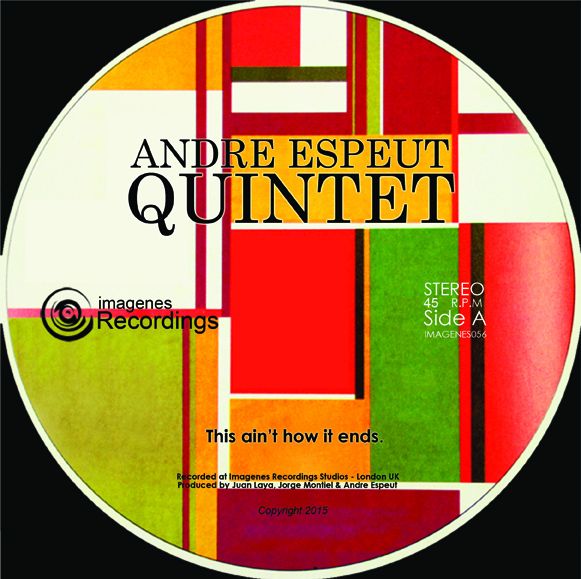 Moving across a Brazilian / Jazzy line with an slick vocal touch on a Curtis Mayfiled vibe Andre Espeut’s and his Quintet comes back with this steady jazzy groover to follow up their debut release ‘Let It Go / Rising” already launched in 2013. ‘Here Today’ is a hugely enjoyable jazzy romp involving some great musicians as well as supremely versatile vocalist Andre Espeut . Guaranteed to make your feet move and your heart skip this track has a touch of Tony Rallo’s classic ‘Holdin’ on’ but with a larger helping of quality jazz. The sunshine comes out for this track as its playful melodies invite you too. Another place where you can’t help but smile. Release date: 04 Aug 2014 from the usual record stores & digital outlets. PS: The launch party for this release will be hold on Wednesday 13th Aug at Topolski Bar / Southbank Centre with the debut of Andre Espeut’s Quintet for very first time performing live. This entry was posted in Blog on June 4, 2014 by admin.